This Monterey Chicken Spaghetti is THE BEST!!! 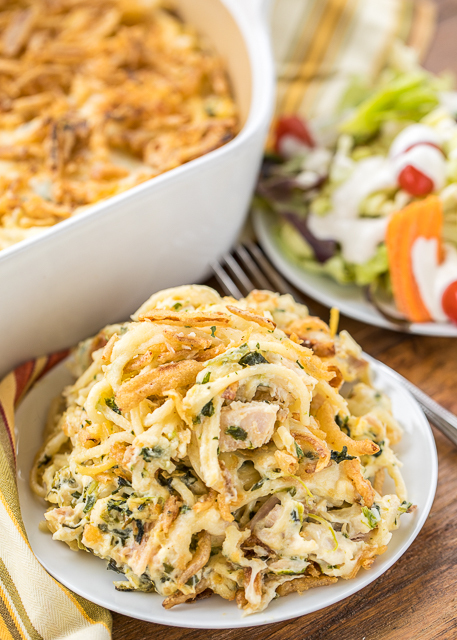 Chicken spaghetti loaded with spinach, Monterey Jack cheese and french fried onions. Seriously delicious! I wanted to lick my plate this was so good. I’m not a big spinach person, but this was the perfect amount. If you like lots of spinach, feel free to double the amount. I am of the opinion that a little spinach goes a long way! 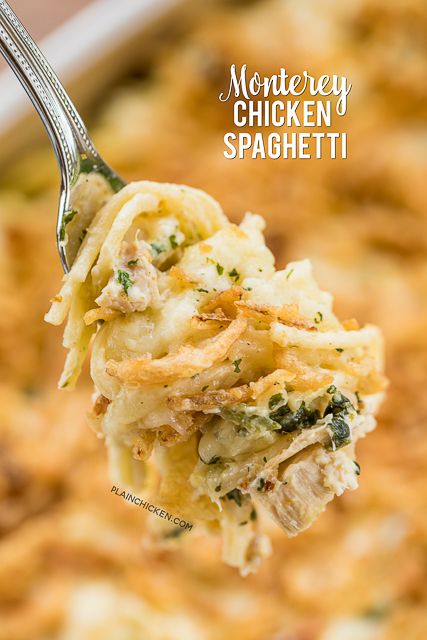 This Monterey Chicken Spaghetti can be made ahead of time and refrigerated or frozen for later. I usually make it the day before and heat it up for dinner. This makes a lot of chicken spaghetti. You can easily split the pasta between two pans and bake one now and freeze one for later. We served this Monterey Chicken Spaghetti with a salad and some garlic bread. This was one of our favorite meals. So yummy and cheesy. I also LOVED the crunch from the french fried onions. Give this a try. I know it will be a hit - even with the spinach haters! Cook spaghetti according to package directions. Drain. 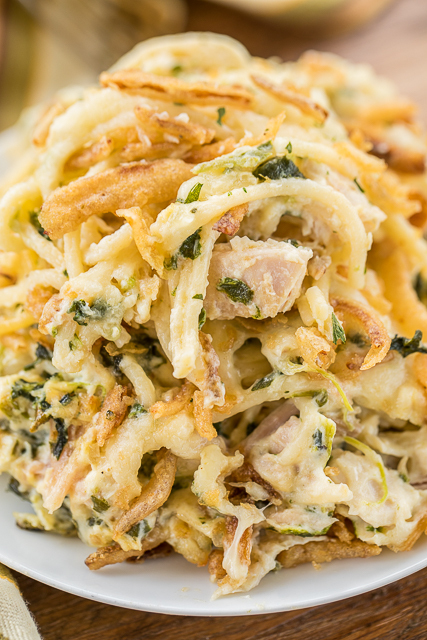 In a large bowl, combine cooked chicken, cream of chicken soup, sour cream, drained spinach, 1 cup cheese, garlic and 1/2 can of French's French Fried Onions. Stir in cooked spaghetti. Pour into prepared pan. Sprinkle remaining shredded cheese and onions on top of pasta mixture. Bake, uncovered, for 40 to 50 minutes. If it's half as good as it looks, I can see myself wanting to like the plate as well. It is crazy good! I wanted to eat the whole pan! This looks so yummo! Gonna try it tonight, and share with all my friends here in Monterey! Oh, your photos spell it monetary, just to let you know! This is the only recipe that I can remember trying that every picky eater in my house loved. It's a keeper! Woohoo!!! So glad it was a hit! Could I use fresh spinach instead of frozen? Thanks! I’ve only made this with frozen, but fresh should be fine too. I like a good amount of sauce with my pasta, can a bit of milk or half and half be added to accomplish that? Or will it ruin the dish and make onions mushy? Thoughts? As long as you fold in the onions last, I think it would be ok. Enjoy! Won't the sour cream separate when it is frozen? I’ve never had it separate. I freeze casseroles with sour cream all the time with no issues. Any ideas for the onions on top. My husband lothes onion that he can see. I get it! I loathe onions too - except these crunchy canned onions. I can eat them all straight out of the can. You can leave them out and the recipe will still be fine. Could you use cooked broccoli instead of spinach? We aren’t much on spinach! Love all your recipes. I fixed the breakfast sausage and cream cheese recipe for supper the other night, my husband said it was the best he’d had!! Also, your corn dip is my go to dip now! Delicious!! I think that would be fine. Just throw in what you like! 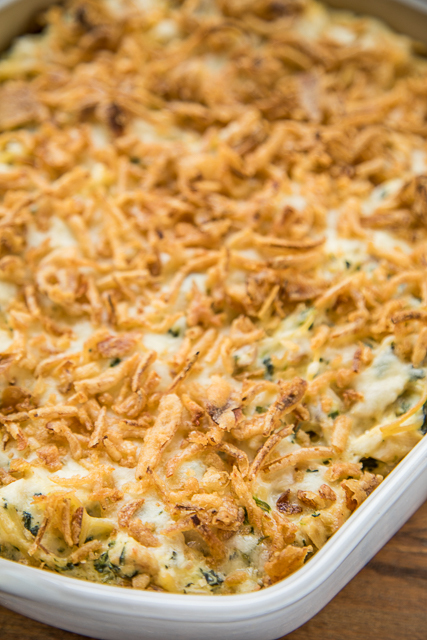 Do you leave off the top layer of French fried onions when you bake this ahead and refrigerate overnight? Then, when you reheat it the next day, do you usually reheat the whole pan in the oven or just microwave individual portions? Can you use spaghetti squash instead? I used Spaghetti Squash tonight! So good! This was SO GOOD!! I baked a large spaghetti squash at 400° for 45 minutes, let it cool while I mixed the other ingredients together, than added the squash in place of pasta! Turned out delicious! Thank you!! This was delicious-I did use 8 ounces sliced cremini mushrooms sauted in 2 T. butter and added the garlic, and a container of fresh spinach wilted down with the mushrooms. I also waited 20 minutes to add the fried onions. I suggest a HUGE bowl for mixing and cutting the pasta or breaking up before cooking for easier combining. Thanks for the recipe-oh and I used the Healthy Recipe soups. I am just short of a full container of sour cream - thoughts on using a little boursin cheese or maybe some cream cheese to make up for it? Thanks! I think either would be fine. Love the sound of Boursin cheese!! How many people would you say this full recipe serves? I didn't use the full container of Sour Cream because I was afraid it would be too rich. Also it took me a lot longer than 10 minutes to put together. The spaghetti takes 7 minutes to cook. Next time I will probably cut the recipe in half or freeze half for a later meal because this really makes a lot. It tastes awesome before it even went into the oven. I also added some chicken broth to mine because it looked to dry. Since you're starting with already cooked ingredients, why does it bake for so long? Wouldn't 30 minutes would be sufficient? Thank you for this recipe! How long would you cook a pan from frozen? Does this freeze well in portions after you’vevbaked the whole casserole? Thanks! I was wondering the same. If making ahead to freeze, is it best to freeze before baking? We will be cooking this for the St. Louis Fisher House at the VA hospital this week! I'm sure it will be a hit! Steph, first thing I'm happy to say is that I've never been disappointed by any of your recipes. I've made a multitude of them, serving them to my minister and his family (eight bio children! ), as well as to other members of our church, and every recipe has been a hit. I'll have to try this with both of those changes. Sounds delicious!! Enjoy! My grocery store (Kroger) has a gluten free option for the onions. I've used them before, and they're great! What do you use for GF cream of chicken, because the Campbell's has wheat flour? I've made this 3 times now and there's only me and my husband! It makes a ton! But we enjoy it and I do enjoy not having to cook every day. The leftovers are just as good as fresh out of the oven. I did find it to be dry the first time I made it. I compensated by adding maybe a cup of chicken broth to loosen it up. Yesterday when I made it, I discovered I was short a cup of sour cream so I threw in a cup of buttermilk I needed to get rid of anyway. Couldn't tell the difference. Nice to know the recipe is adaptable.